The humanoid is being transformed when its tongue goes into the frog or bird; the rattle is showing a transformation that is used for healing. This type of rattle was not used for evil; it was used for good. I think we have to really emphasize that this is a healing rattle. This rattle shows Raven carrying the sun in his beak. 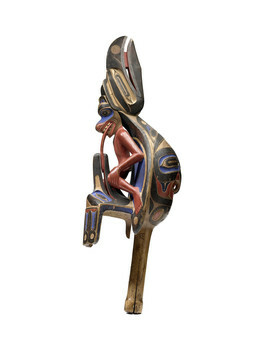 On Raven’s back, a human-Ulala (Cannibal) figure extends its tongue into the beak of a crested bird, symbolizing the exchange of spiritual power between the two beings. A sparrow hawk design covers Raven’s belly. Shamans, who used these rattles in healing ceremonies, believed that healing and clairvoyant powers came from birds and animals. Chiefs carried raven rattles during ceremonies of the Haida secret societies.